The new warship is expected to be delivered to the Royal Australian Navy in 2018. Australia’s second air warfare destroyer, Brisbane, began sea trials off the coast of southern Australia this week, according to a November 20 statement issued by the Air Warfare Destroyer Alliance (AWDA), a private-public consortium responsible for the destroyer program. The first set of sea trials is expected to test Brisbane’s propulsion, maneuvering, control, and navigation systems. Following the successful completion of the first phase, a more advanced phase of sea trials scheduled for 2018 will test the destroyer’s combat and communications systems. The 7,000-ton Hobart-class of guided-missile destroyers is based on the Navantia-designed Álvaro de Bazán-class frigate (aka F-100) currently in service with the Spanish Navy and is intended to replace the Royal Australian Navy’s (RAN) six Adelaide-class guided-missile frigates. Only three Adelaide-class frigates remain in service with the RAN, of which one will be retired by the end of December. Replacing them will be purportedly the most complex and capable class of surface warship ever operated by the RAN. The new Hobart-class guided-missile destroyers are “multi-purpose weapons platforms that can be used for anti-surface and anti-submarine warfare operations, as well as gunfire support roles, next to the defending naval task forces from aircraft and missile attacks,” I explained elsewhere. The ships are fitted with the Mark 41 Vertical Launching System capable of firing surface-to-air missiles, Harpoon over-the-horizon anti-ship missiles, and light-weight torpedoes, next to a Mark 45 127 millimeter gun. The Hobart-class can also carry one MH-60R Seahawk anti-submarine warfare helicopter. Each ship will be equipped with the AN/SPY-1, an advanced, automatic detect and track, multi-function phased-array radar system, which will be paired with the MK 41 Vertical Launching System, capable of firing Raytheon’s Standard Missiles (SM) of all variants as well as the RIM-162 Evolved Sea Sparrow Missile. The SPY-1 is the heart of the Aegis combat system. The Hobart-class program suffered from repeated delays since its inception. 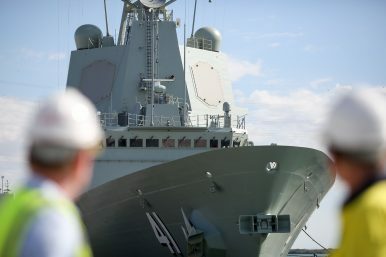 One of the consequences of the multiple delays has been that the Hobart-class’ Aegis combat system — an automated command-and-control (C2) and weapons control system offering integrated air and missile defense capabilities to surface warships — purchased by the Australian Department of Defense is purportedly outdated and will likely need to be expensively upgraded, given that the U.S. Navy already developed a more advanced version of Aegis. Total procurement costs of Hobart-class are already estimated to be around $8 billion making it Australia’s most expensive weapons program ever. The Brisbane is slated to be inducted into service in September 2018. The first-of-class air warfare destroyer HMAS Hobart was formally inducted into the RAN this September. The Brisbane’s sister ship, HMAS Sydney, is expected to be delivered to the RAN in March 2020. The new destroyer has undergone a series of trials to validate a number of its weapons systems.